The Starling is a gregarious songbird. Some species have lustrous dark plumage; others are iridescent and brightly colored. 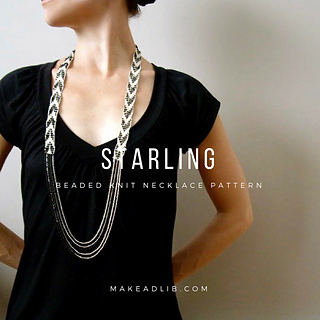 The Starling Necklace can be equally varied. Worked all in one piece, it uses a feather delicate beading pattern and simple stitches with stunning results. The finished necklace measures approximately 44 inches, but the length and color possibilities are endless. Show it off with a brightly colored shirt and jeans or attempt dark subtlety with your sexiest little black dress. Either way, be prepared to be noticed.